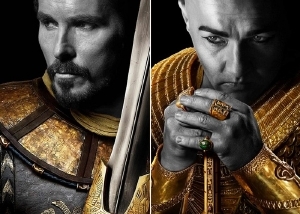 20th Century Fox has released the FINAL trailer for Ridley Scott's EXODUS: GODS AND KINGS atarring Christian Bale, Joel Edgerton, Aaron Paul, John Turturro, Sigourney Weaver, Ben Mendelsohn and Ben Kingsley. The epic hits the big screen on December 12, 2014. The film has come under fire for casting Caucasian actors in the role of ancient Egyptians.